Astronaut Eugene A. Cernan (left), commander, and Scientist-Astronaut Harrison H. Schmitt, lunar module pilot, simulate collecting lunar samples during extravehicular activity (EVA) training at the Kennedy Space Center (KSC), Florida (48888); Apollo 17 crew ride in a Lunar Roving Vehicle during lunar surface EVA simulation training at KSC. Cernan is seated in the left-hand seat and Schmitt is on his right (48889); Schmitt procures a geological hand tool from the tool carrier at the aft end of the Lunar Roving Vehicle during lunar surface EVA simulation training at KSC. 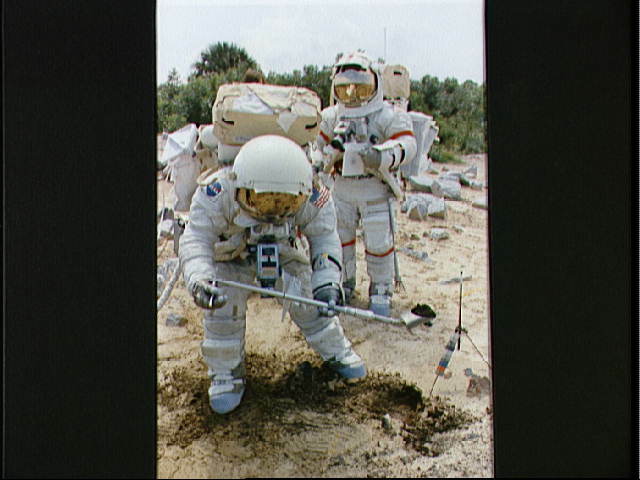 Schmitt grasps a scoop with extension handle in his right hand (48890); Schmitt (foreground) simulates scooping up lunar sample material while Cernan (background) holds a sample bag (48891); Close-up view of Cernan and Schmitt riding in Lunar Roving Vehicle during lunar surface EVA simulation training at KSC. Cernan is seated in the left-hand seat. Schmnitt is on Cernan's right (48892).